Ah. Christmas and New Year are so close I feel like I can smell them! I guess in some way, I can! It smells like cardboard, packing materials, and (more pleasantly) baking! I’m trying to get some things wrapped up both literally and figuratively before this weekend comes along. Last week was crazy busy with various things, including a very fun surprise birthday party that we threw for Cassie 😀 Needless to say we had a blast. My Avon business filled many other hours. Then came more fun stuff: knitting and baking/cooking! This time of year is for friends, family, food, and festivities. Yes, I equate knitting as a festivity! I’m so excited to be making some headway on my current projects! A while back, I made a fingerless mitt by just making something up. You may remember it from here. My newer mitt is basically done now. I just need to do the thumb of the first new mitt and I love it! 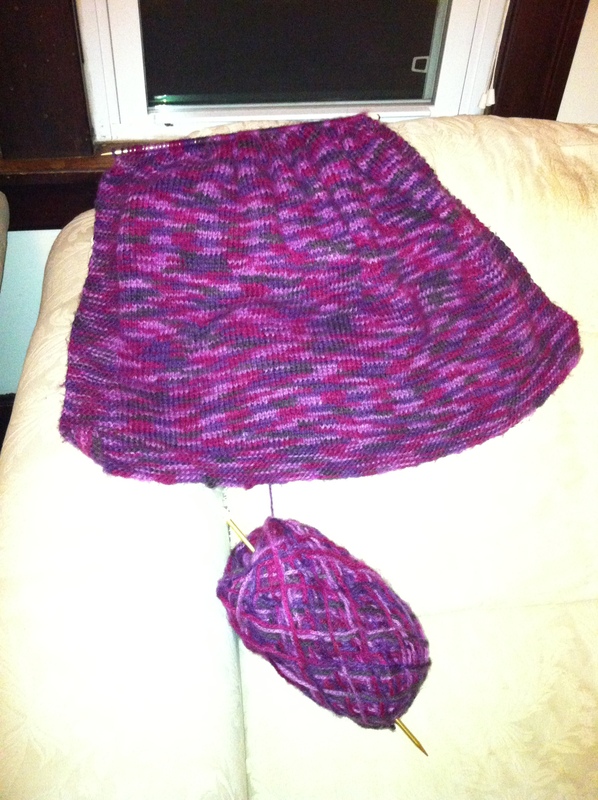 I’m hoping I can make the second one come along quickly now that I’m comfortable with the pattern. I also finished momma’s scarf! I ended up giving it to her for her birthday instead of Christmas. I’m quite pleased with it. It matches her coat perfectly and is more substantial than I anticipated, seeing as it is crocheted out of fun fur. This is something(s) new I got last week! 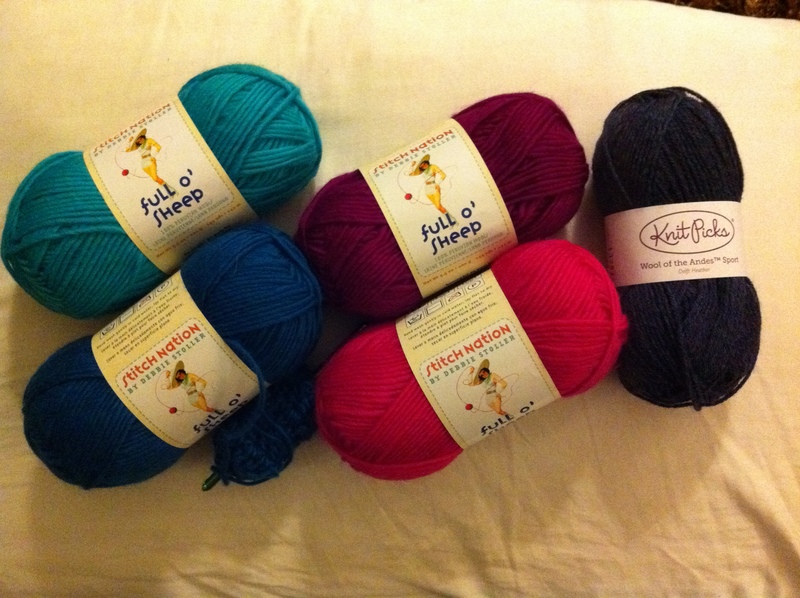 The KnitPicks (there are three matching skeins stuffed into my stash) is a gift from my lovely knitting buddy Alethia. In case you can’t really see it, it’s a wonderful purple/blue heather and I would love to make it into some sort of shrug/vest kind of thing. It’s a sport weight yarn, 100% Peruvian Highland Wool. I’m know that weights and materials make a large difference in the way something works up, but I really don’t know what materials do what in the sense of wear and drape. 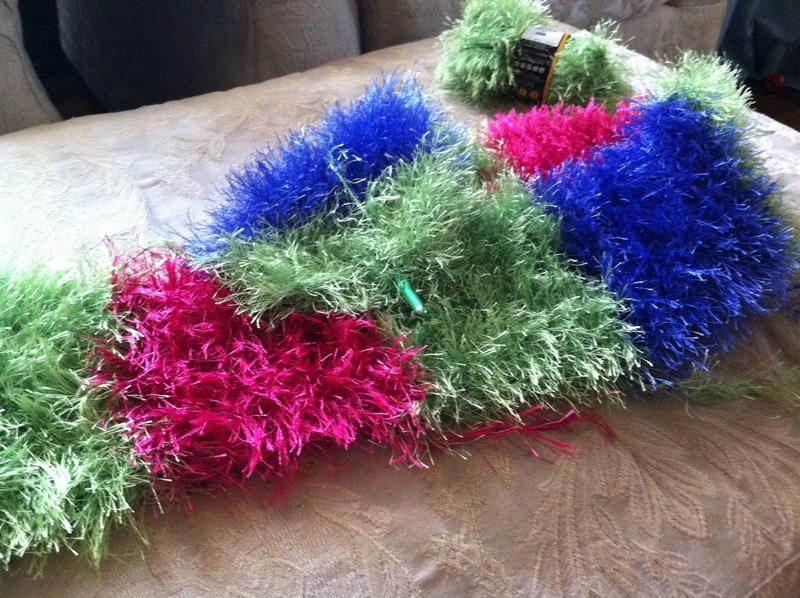 Anyone have any pretty (and relatively simple) ideas for a shrug/vest with this type of yarn? I’m all up for suggestions! The other yarn is for something new as well. I’m going to try felting! Can I just add that 100% wool is challenging to find around here? The idea as a whole doesn’t necessarily appeal to me, but I saw these adorable Felted Notions bags in Alice’s blog, Crochet With Raymond and I simply had to give it a go! I’ve got the bag in the wash this evening so I’m curious to see how it turns out after the magic is complete. That about sums up my extra-curriculars lately. I’m greatly looking forward to the next week as there is a whole bunch of NOTHING planned besides Christmas day chilling out with my folks and siblings and then visiting extended family on Monday. Ah. Sweet nothing. I can sit and knit and crochet and visit and relax. I just need to finish wrapping and baking first! Until next time, have a very merry Christmas and enjoy doing whatever you and yours do to celebrate! Merry Christmas from Mina & Me! 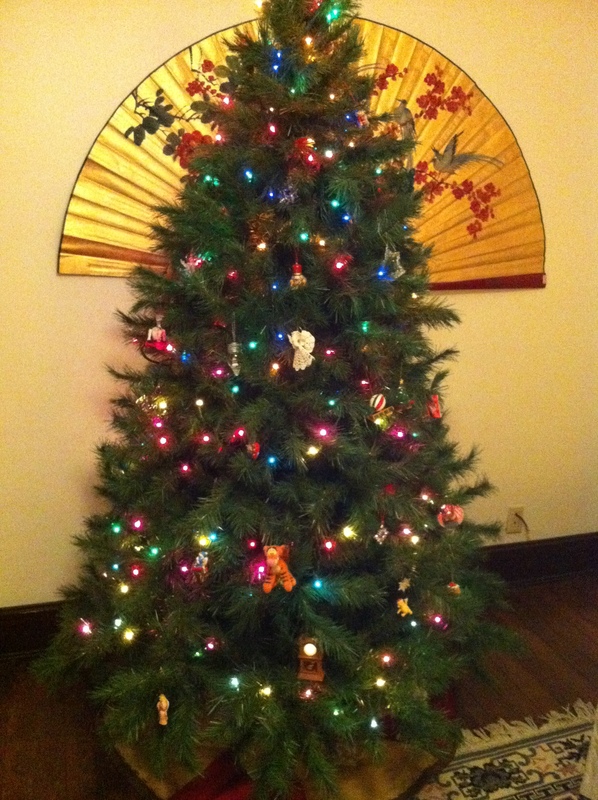 At long last, our Christmas tree is finally standing and our house is officially set. Please keep in mind that Bryon and I are still young and haven’t even been out of our parent’s houses for 2 full years yet. Obviously our tree is a bit sparse. 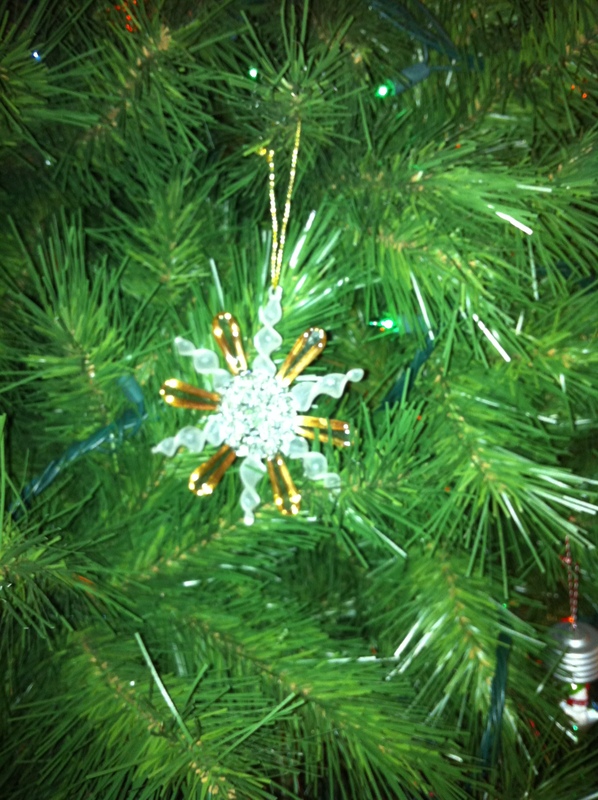 The ornaments we do have were the ones we had growing up that we kept upon moving out. I got the idea from the charming Teresa about showing a few key ornaments that help define who we are. 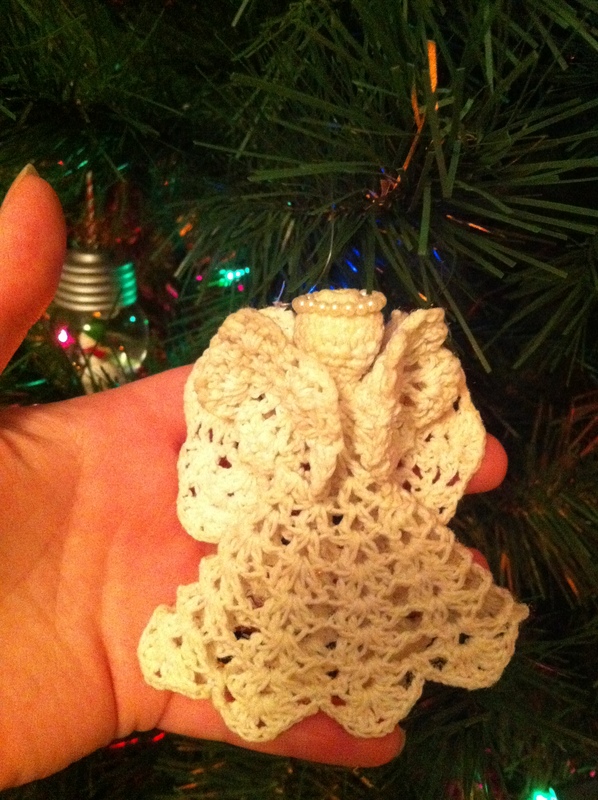 A tiny crochet angel made by my grandmother on my dad's side. One of my many glass/crystal snowflakes. I think are stunning! Needless to say, these types or ornaments are much higher up to help save them from Mina. Many of Bryon's childhood ornaments light up or are animated when plugged into the string of lights. This adorable little clock is both! 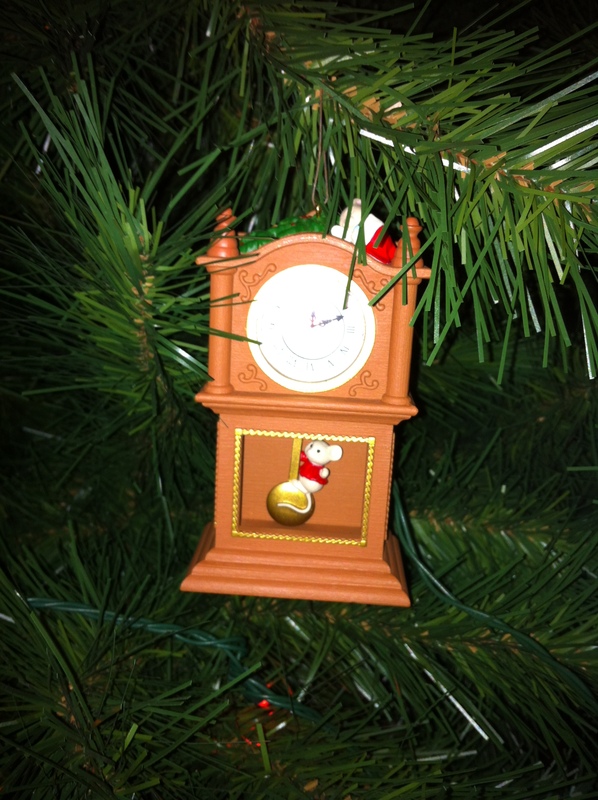 The clock face lights up and the pendulum with the mouse on it swings back and forth. 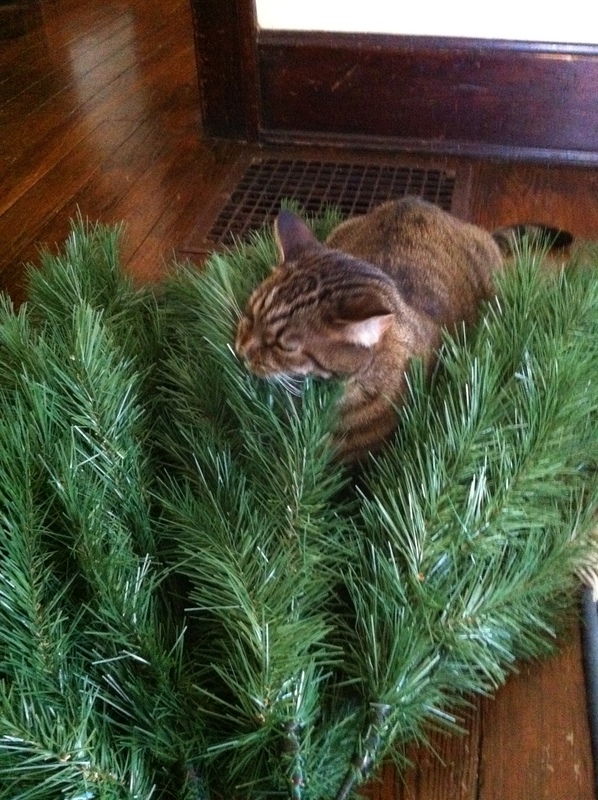 Mina had fun eating helping with the tree. Yes....we have a fake tree. I understand the considerable debate on this, but it is what it is! Crazy cat. She’s been all sorts of nibby this week! 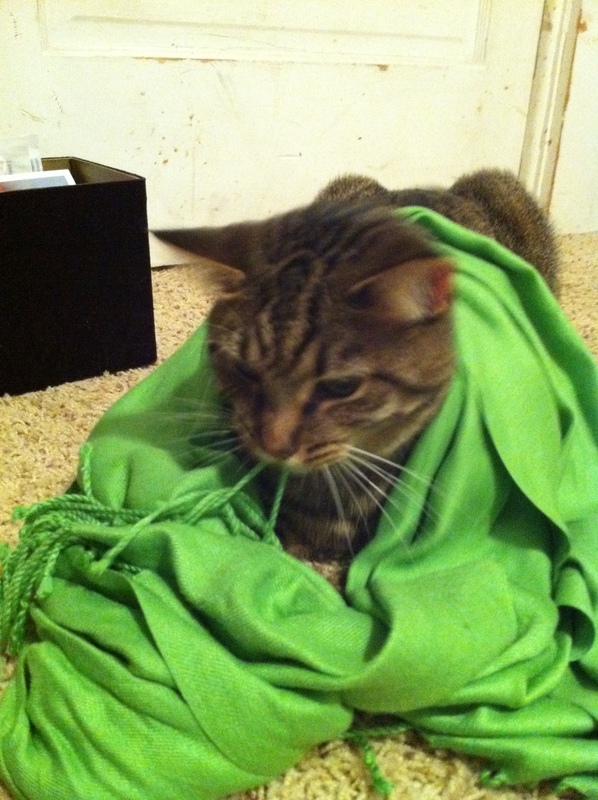 She got herself twisted up in Cassie’s scarf this past Friday as well. Speaking of Friday, my work schedule changed this week. Previously I had worked Monday through Thursday, working long hours each day. I still work the long hours, but now I work Tuesday through Friday. I was not very pleased with this new change for various reasons, so I was not happy as I drove to work this past Friday. 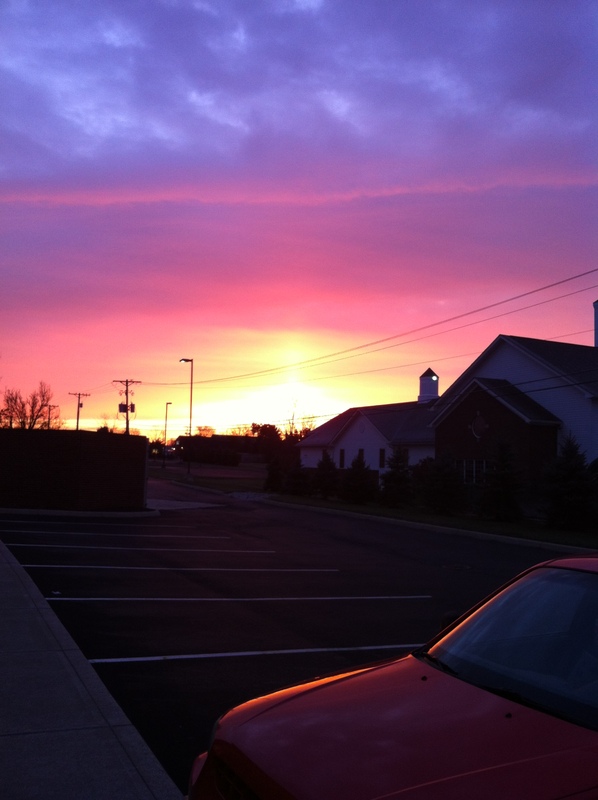 When me and my grumpy self got out of my car when I arrived, I had my breath taken from me by a BEAUTIFUL sunrise! My day started to get better after that! Saturday went well also. We had my sister’s bridal shower that morning! 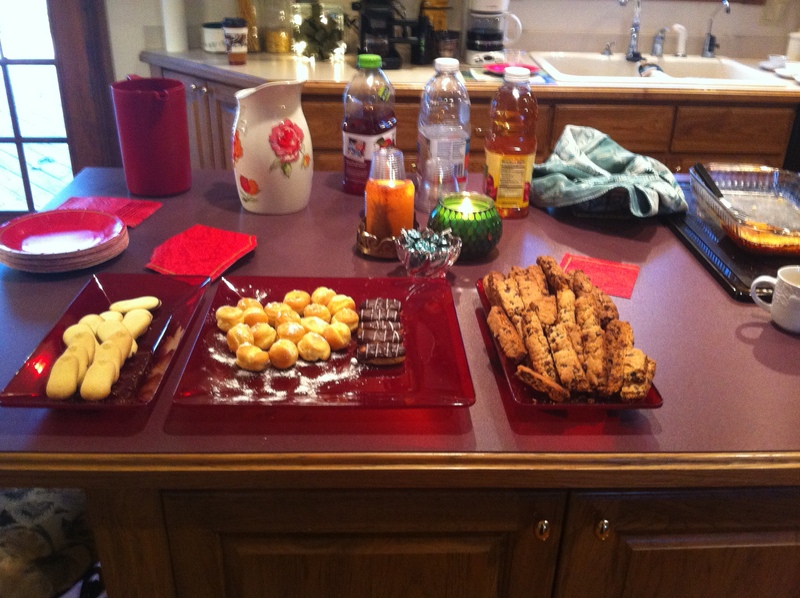 I made my chocolate chip biscotti again, Cassie made a cheese fondue, Sara Lynn loaned us her espresso machine, and we bought several other little foods to go along with the rest. The biscotti recipe was requested last time I mentioned it and so I will put it up at the end of this post! 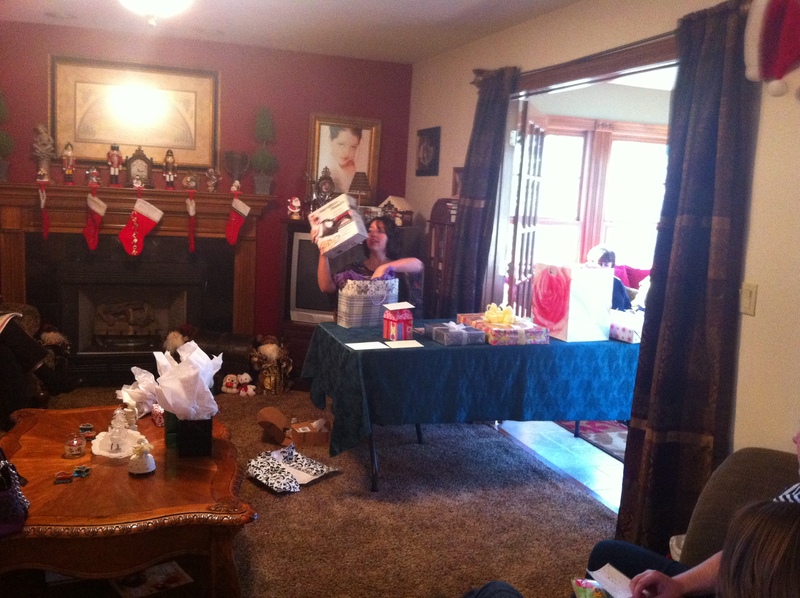 Sara had a wonderful time visiting with friends and family, munching on treats, and opening her gifts! I hope her mini scarves turn out well. My latest scarf is nearly done! I only have a few inches left so I feel comfortable spending some time working on my other projects. 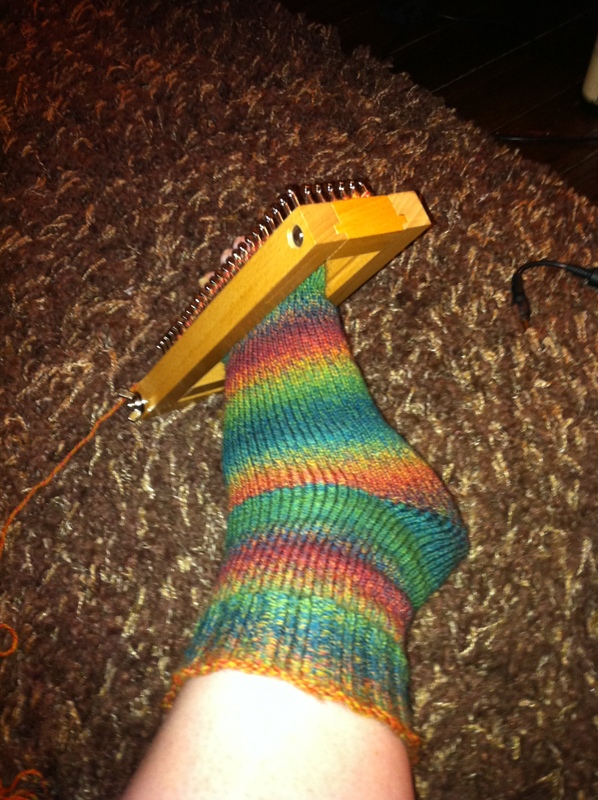 My sock is coming along nicely for one thing. 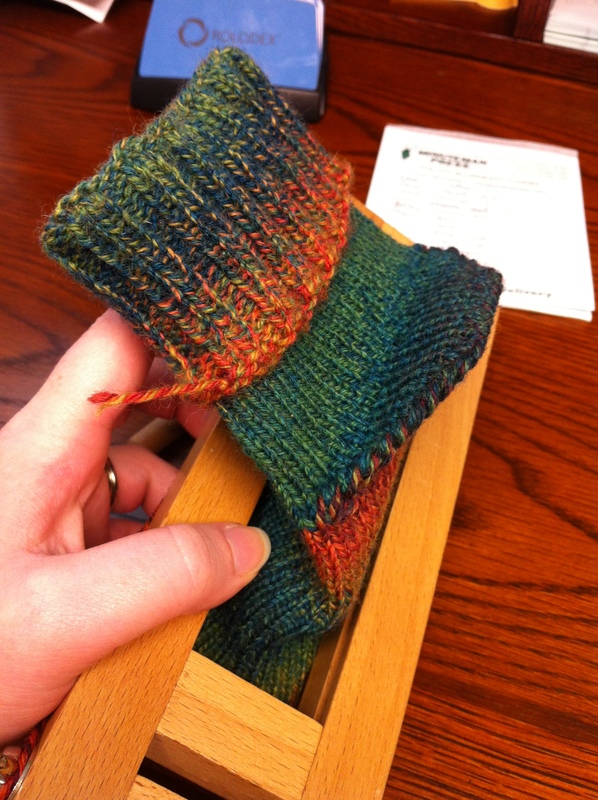 What you're seeing is obviously the cuff folded down, the very flat heel, and the toe of the sock emerging from the loom. I know I’m painfully slow, but I do enjoy what I manage to do! Well everyone, I’m off for the evening. Here is the biscotti recipe! I got it from a magazine so it calls for a particular store-bought ingredient. 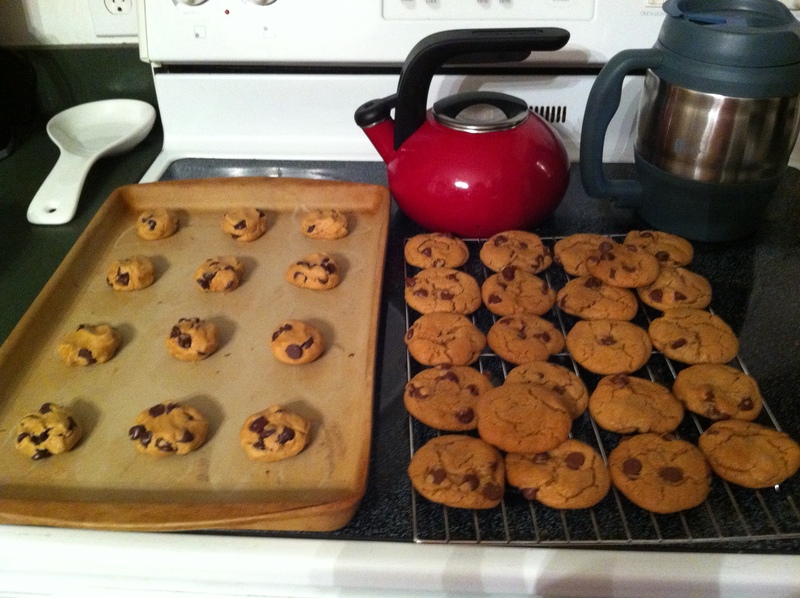 Make cookie dough by blending mix, butter, egg, and flour until a stiff crumbly dough forms. Stir in choc. chips (or other items such as chopped hazelnuts if you like). Form into rectangle of desired size onto an ungreased cookie sheet. Bake at 350 degrees for 25 minutes. Cool for 15 minutes before cutting into 1 inch wide strips. Place strips on their sides back on the cookie sheet and bake 10-12 minutes. Be sure to flip once. Place on cooling racks and cool completely. The candlelight walk was very pleasant. It wasn’t snowy like it was last year, but it was just cold enough to make the cookies and hot cocoa mighty enjoyable after trekking around outside. 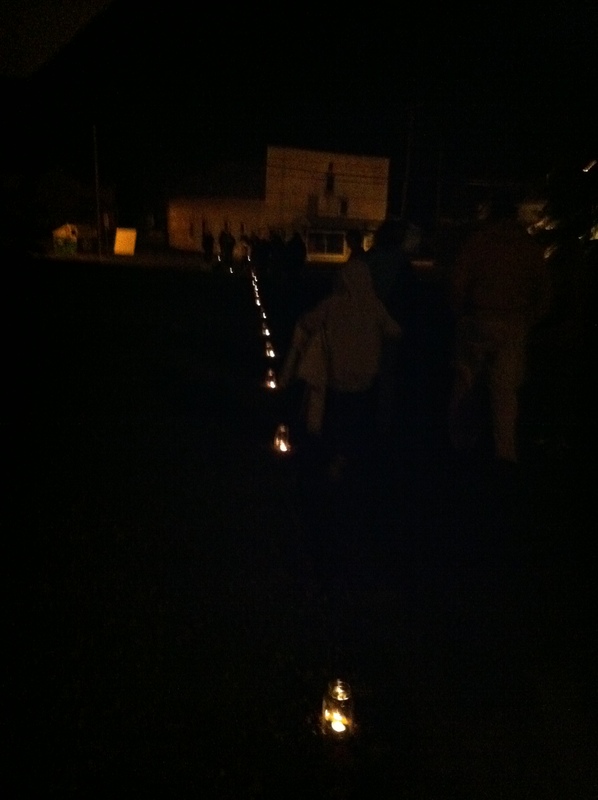 We followed the luminaries throughout the town to each of the churches for a mini-service from each. 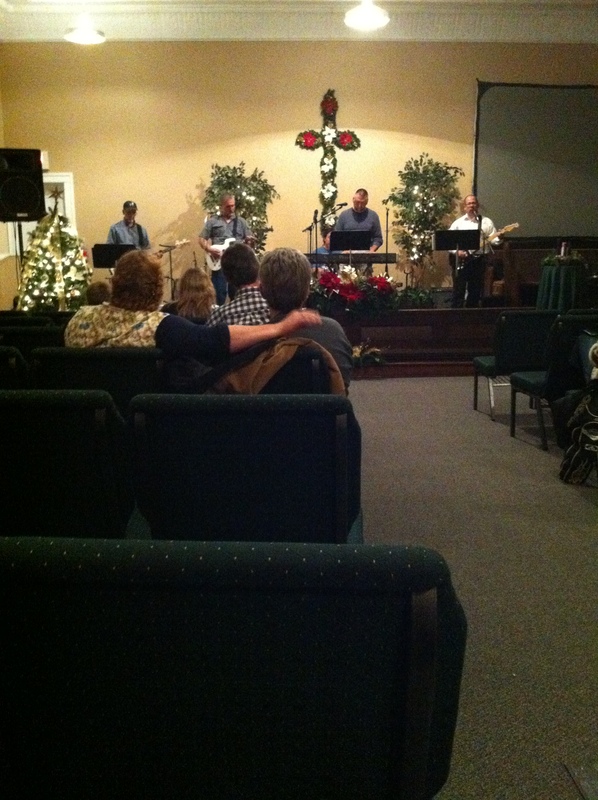 After the refreshments at the last church, there was a short concert back at my church. A group of wonderful gentleman I know make up a group called Clear View Mirror and they have a whole lot of fun performing highly upbeat contemporary worship music. I’ll admit I got a few odd looks from the visitors from the other churches during the concert. There I was, sitting in my chair, tapping my foot and bobbing my head to the beat whilst knitting away at my purple blanket. My own church family is quite used to my yarn accompanying me wherever I go 🙂 I’m happy to admit my blanket is coming along very well! Considering I’m working on it amidst all of my other projects as well, I anticipate having it complete by New Year. It needs a good blocking, but it'll be great! 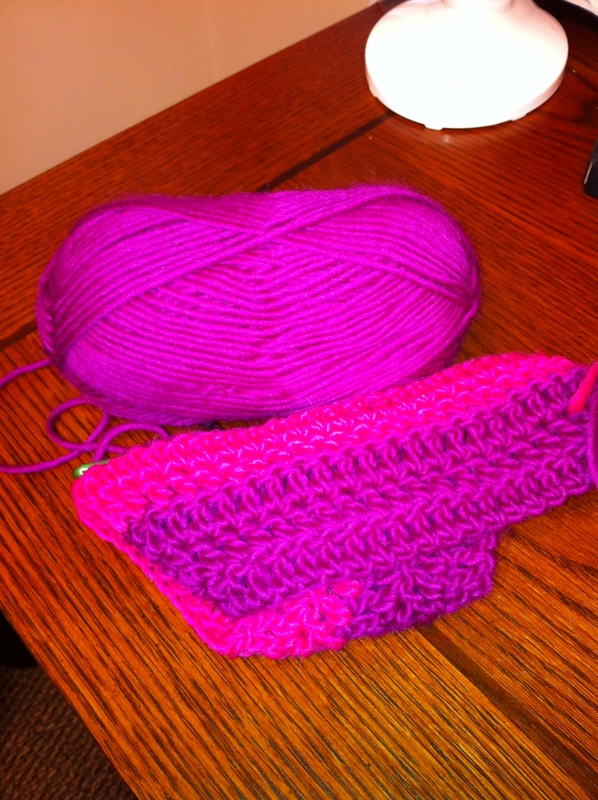 I’ve also gotten some progress in on my second fingerless mitt. 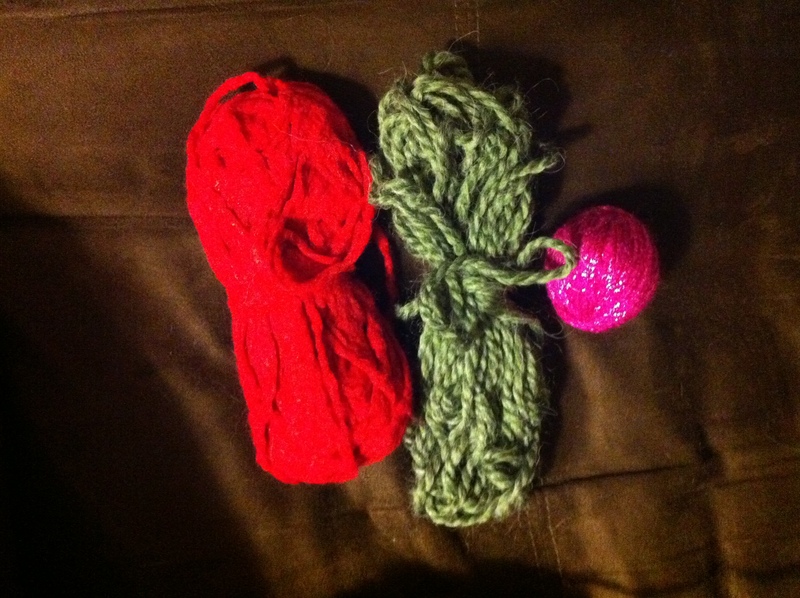 I’m beginning to think that if I have enough yarn, I would like to make three instead of just two. My first one has several little blips in it since it was my experimental mitt. I’d like to have an even looking set. I bought some metal circulars to use for this second one since the wooden ones didn’t agree with me. I’m loving it! Ah, the ease and speed of metal needles ^_^ The lovely, sproingy, soft and colorful yarn is gush worthy as well! I love working with 100% wool! My latest project doesn’t have a bit of wool in it, but the material was a special request from my mother for her Christmas scarf. She requested fuzz/hair. The option which had the colors best suited to match her jacket was in the Fun Fur section. I’m back to crocheting with this project and it feels very nice to have my first love back. It’s coming along nicely and I really hope she likes it! I’d post a pic of my progress, but seeing as she reads my blog, I’ll keep it hidden from her until Christmas 😉 Love you Momma! Mina has been feeling remarkably clingy lately and I’m not sure why. I can hardly sit down for more than five minutes before she crawls up onto me. 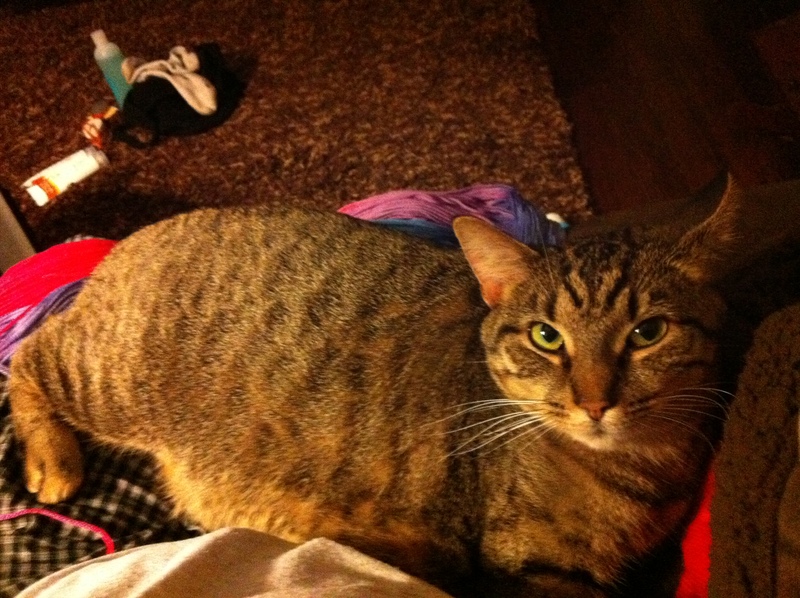 You can see the yarn in my lap peeking out from behind her bulk. My foot soak stuff is visible on the floor. It’s been way too long since I pampered myself in that way. It is such a pleasure to sit and knit while my feet soak in a hot tub of water with fizzing aromatic salts. Bliss! I highly recommend it to any and all of you ladies! I also managed to get some of the Christmas decorations up! Finally! Everything is up with the exception of our tree. Due to some outside factors, there will not be room for our tree until some of our furniture becomes relocated this weekend. 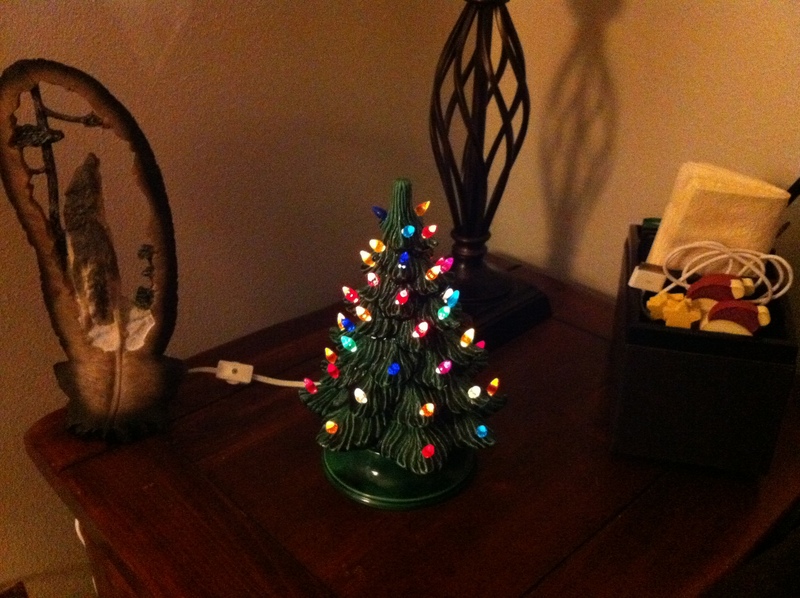 For now, this little tree shall suffice! 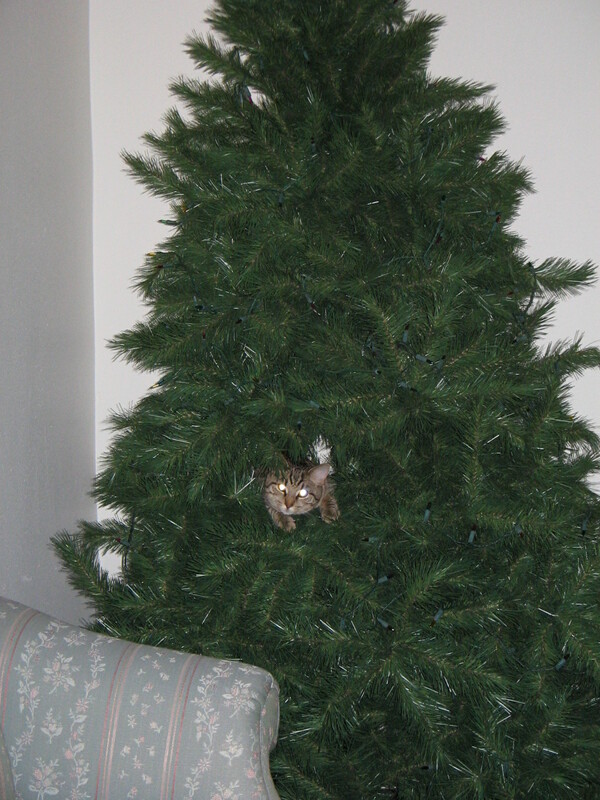 You can imagine how hard it was to decorate the tree with her crawling around in it! I can imagine this year will be a similar challenge. I’ll let you know how it goes! My sister’s bridal shower is this weekend, so I’ll be busy getting things together for that. I’m hoping hers will be as enjoyable for her as mine was for me! Have a wonderful week!